After many, many years, I think I have this hockey dad thing down pretty good. With only a few good years of senility left, I feel like I should pass this knowledge on to someone. A hockey dad is part general, part philosopher, part psychologist. He has to be patient, caring and strong. It also doesn’t hurt to be slightly crazy. Hockey dads need to have the ability to dress in the dark. Typically, it’s 5 a.m. and you need to wake up the kid, make some kind of breakfast, pack the car, and carry incoherent hockey mom to the car in her bedazzled team-colored blanket until you can find a Starbucks for her. So clothes have to be comfortable and quick to put on. I find jeans, a sweatshirt and flip flops works best. No socks! Your chances of matching sock colors in the dark are about as good as your chances of finding a hockey stick that doesn’t shatter on its 31st day. Also, with no shower happening, a baseball cap is best. Put the sunglasses on the brim in case the refs recognize you from that Anaheim incident a few years back. Next, get a good traffic app with real-time alerts. You’ll be driving the actual mileage it takes to fly to the moon except those lucky astronauts just get to point their vehicle and shoot in a straight line! No merging to carpool lanes, no trying to unwrap McMuffins while steering with your knee and no pit stops for hockey mom once that Starbucks hits her thimble-like bladder! A hockey dad needs to have buns of steel and the right leg of Arnold Schwarzenegger. Did you ever see that commercial during the Super Bowl for Skittles? The one where the old western townsfolk settle their differences by arm wrestling and all their right arms are extra huge and bulbous? Yup, that’s us hockey dads walking around the rink with a very pronounced limp because our gas-pedal leg is so tremendously strong! My left leg, on the other hand, is so puny and useless I’d trade it for an Easton stick that never broke or bladder-enlargement surgery for hockey mom! Hockey dads need a very warped sense of right and wrong and should extremely overreact to all events occurring to their child during the game: Tripping penalty!!! Are you insane??? Use your good eye next time ref!!! 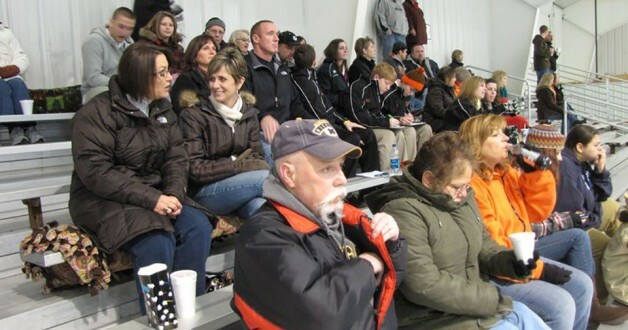 Hockey dads also need to know how to answer all of hockey mom’s questions – correctly. This is very important, so memorize this section if you learn nothing else. At some point, many scenarios will take place where hockey mom will ask you if their little Billy is okay. This is probably due to the fact that she just came back from the bathroom, or turned away because someone was laying hurt, or was distracted by talking with other moms, or actually noticed Billy isn’t doing so well and wants to hear you say that isn’t true. Here are your three responses to everything: He is doing great! Everything will be just fine! Where did we park the car? I forgot something in it. Finally, a hockey dad must have strong, wise words for their little player when they’re alone in the back of the car getting ready to head off to the locker room. A strong grip is also good because oftentimes, said little player will be trying to bolt as fast as possible before enduring such wisdom. Here are some tried-and-true pearls for you to use: Fall seven times; stand up eight. Every accomplishment starts with a decision to try. You’ve got what it takes, but it’ll take everything you’ve got. Is hockey mom still reading over your shoulder? No? Good. Here’s the real stuff: Here’s a twenty; I want two goals and an assist. That AAA coach will be here today; step it up. After the game, I’ll be hiding in the parking lot, and your mom will be in the bathroom. Scott Johnson is a Santa Barbara resident and the father of four hockey-playing children.